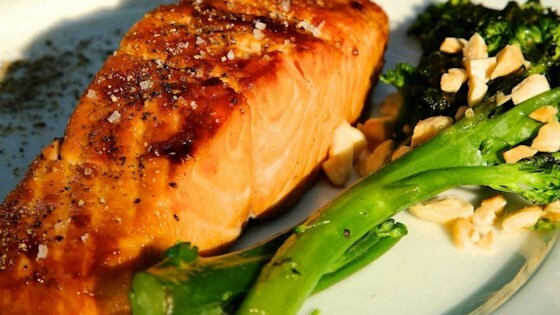 "This recipe is the most delicious salmon recipe, easy to prepare and very refreshing. Everyone that ate this dish loved it. I made this recipe, and it is easily my favorite." Heat 1/4 teaspoon olive oil in a small skillet over medium-high heat. Saute garlic in hot oil until just beginning to brown. Mix sauteed garlic, soy sauce, lemon juice, honey, 1/2 teaspoon olive oil, brown sugar, sea salt, black pepper, and red pepper flakes together in a bowl; pour into a large resealable plastic bag. Add salmon fillets, turning to coat with the marinade, squeeze bag to remove excess air, and seal the bag. Marinate in the refrigerator for 1 hour. Remove salmon from the marinade and shake to remove excess liquid. Reserve 3 tablespoons marinade and discard remainder. Heat 1 tablespoon olive oil in a large skillet over medium heat. Arrange salmon fillets in the hot skillet, pour reserved marinade over the salmon, and place a lid on the skillet; cook until salmon is browned on each side and flakes easily with a fork, occasionally spooning liquid from the pan over the fillets, 2 to 3 minutes per side. Garnish salmon with additional sea salt and black pepper. For the best results, use Icelandic sea salt and organic Tellicherry pepper. I made it for my wife and it was great. this salmon recipe is fantastic,i will be making this again.